Shekina Glory was a mix of Boone and Story County residents. They were one of the first groups in Boone County performing what became known as “contemporary Christian” music. The idea for the name came from Al as it indicated the light and power of God and His presence on Earth. Al was born and raised in St. Ansgar in far northeastern Iowa. He acquired his first guitar, a Silvertone from Sears, in 8th grade. Al’s first group involvement was a band named the 4 Spirits. In his freshman year at ISU he participated in a few short lived groups and played solo in coffee houses in the area under the name Steven James. Brent had been in “Jesus is Life” whose members knew each other from meeting at Lay Witness weekend events which were popular in the early 70’s. That group fell apart after the death of one of the members due to injuries suffered in a automobile accident. Also, from a musical perspective, they were moving is different musical directions at the time. Al and Brent met each other during a Telecommunicative Arts (TCA) Summer class at Iowa State University. In 1971 while Al was filling the position of camp counselor at Riverside Lutheran Bible Camp in Story City, Iowa, a very close friend had died by drowning. As mentioned elsewhere, this was at the time of what was called the Jesus Movement or Jesus People Movement in several publications of the day. Al, along with several other counselors at the camp, came to faith — or was saved/born again — at the funeral for this friend. In Al’s words “I was hit by the Holy Spirit like a ton of bricks. . .”. This colored the meeting of Brent and Al in the TCA class. In the Fall of 75, Al and Brent were roommates, living in a house just off campus while attending ISU. It was a mutual idea to form some sort of performing entity more than likely as a result of rooming together. Al had a good lead vocal capability and song writing skills. Brent had what was needed to hold down his end of things along with a small Peavey sound system. Members were added through invitation. Instead of formal auditions, Al and Brent met with folks presenting their idea for the group. If that appealed then a trial run to see if they could come up with a “sound” which might be “effective in drawing people to come to Christ”. Brent was playing a red Fender Precision bass with a maple neck along with a Peavey 400 watt bass amp head and a Cerwin-Vega speaker cabinet with a folded 18” speaker and a front facing 12”. Joannie played an Elka electric piano which was upgraded to a Fender Rhodes in 1976. There is no mention of an amp so she may have played direct through the group’s PA system. Russ played a variety of guitars: a reverse Gibson Firebird, Fender Stratocaster, and a Martin D-18. Al had two different guitars - an Ovation acoustic/electric and an Ovation Breadwinner electric 6-string. Dan had a Ludwig Octoplus kit finished in white. The make of Laurie’s flute is not remembered. After starting out with the small PA that Brent owned, the group eventually bought a Peavey 900 powered board along with Peavey System 1 speaker cabinets. Along with that purchase they added AKG-1000 mics which were one of the popular mics of the time. Shekina Glory did a 50/50 mix of cover tunes and original songs written by Al and, perhaps, Russ. Some of their influences were Love Song, The Way, Paul Clark & Friends, Lamb, Larry Norman, Phil Keaggy and Honeytree. No doubt the songs they covered were from such groups. The process was similar to the usual way songs were chosen; someone would bring a tune and the group would work on it. If the members liked what they came up with the song was added; if not, it was discarded. Unlike cover tunes, all originals were kept as each member contributed to the overall sound of the song in question. The first to join were Joannie Whipple (keyboard, vocals), Russ Musilek (guitar, percussion, vocals and Laurie Hoifeldt - soon to be Musilek - (flute, vocals). Brent knew all these individuals having played in various situations with them all. He performed with Joannie at coffeehouses and knew Russ and Laurie from high school. Dan was a last to be added. He was known to Al through Dan’s older brother who was also a counselor at Riverside Bible Camp. 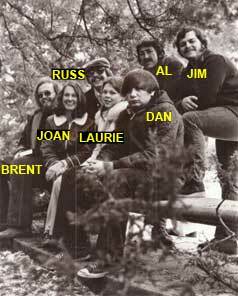 Jim Crowder, an acquaintance of Russ’, was added as their sound tech when the group was ready to go public.